Minimum quantity 50. Quantity variation +/- 4% is possible & billable. A custom-made 12-month spiral bound appointment wall calendar with 13 of your own full color pictures. You take the pictures; we print the calendar with your pictures. The very best in custom printing. The ad imprint is printed on every month. You can have a different photo for each month. We can start your calendar with any month. English, Spanish, and French languages are available. Your images cannot be printed to the edge of the sheet. Calendar Size: 11"w x 8 1/2" h closed. 11"w x 17"h when open. Price Includes: Your 13 full-color images. With grids B & C the ad imprint can repeat on every sheet or have a different imprint every month. Grid A does not have room for an ad imprint. 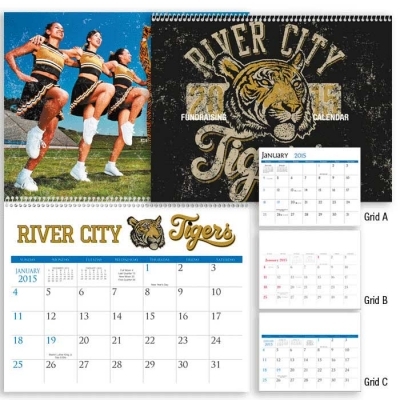 Digital Full Color Process on mid section of calendar, every month, 9 1/2"s x 1 1/4"h.
Digital Full Color Process on top, 10"w x 7 1/2"h.
10 days after proof approval. Approximately 2 business days for a pre-production proof.